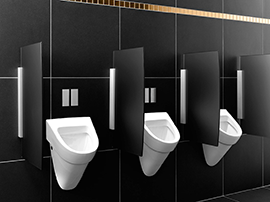 Reduce your business' water consumption by as much as 90% with a water saving system for your washroom. As we join together and raise awareness on the 22nd March for World Water Day, it makes you stop and think if there is anything that you can do as a company to save water, not only for the environment but as a way of making financial savings. One of the ways of doing this is by fitting a urinal water saving system. TWC Group offer this service to our customers to help save water. Not only can we install them for businesses but we maintain them for you, giving you one less thing to worry about. All the devices are approved under the latest standards and can help reduce water consumption in this area of your business by up to 90%. Please call the TWC Team on 01845 525070 for a free quote today.